At the moment, Marketr will send out follow up emails after a set amount of time when the invoice/ticket as been completed. What I'm proposing is to change it so it works when the customer last visited. So lets say, I've got Marketr set to send 3 month follow up. A customer visits my place in August and then again in October. At the moment Marketr will send a 3 month follow up in November and then another 3 month follow up in January. If Marketr is changed so it only sends reminders based on when the customer last used me, the customer wouldn't get two 3 month follow ups. This means I can also set a follow up reminder if the customer hasn't used me for 12 months. We bought the life camera suggested in your hardware page thinking it was to take pictures of assets customers bring in. Would love it if you could add this feature. Make it so that when you enable it under advanced settings, that when you get to the new asset dialog box, there will be a mini preview of what the camera sees with a save picture button that will take and save a picture of the asset to repair shopr. At some point last year we added this and didn’t realize this wasn’t marked as complete! We get a lot of SPAM sent to our Leads email address and lots of duplicate leads, and due to the confirmation message with deleting it takes a while to clean them up. I'd like check-boxes so I could select multiple leads and delete them all at once. Looks promising as it offers a free tier and could possibly be another option to Domo. You can use a web request and get the data from the API right now! Can we have a self generating unique ID for customer Asset? Some systems we get in don't have a unique ID/serial number, such as custom builds. This unique ID could then be printed in a barcode as the unique asset tag. This has always worked – if you leave the serial number field blank there is a barcode label that does have a unique identifier built in. You could scan that to get the barcode value into another system. Delete Multiple Customers due to import error. We need to have a tick button or bulk action for multiple removal of un-needed accounts. I have 5000 of the same name's "SucureTec Australia" we need to remove these items. Having someone on the system for 2 weeks gong into the account and then action delete it to time consuming. Please can this be added. Also maybe add a bulk action of disable the account. You can do this via csv already. Please write support and they can help you through it easily. It would be great if our techs could mark the time they spend on a ticket as chargeable/billable from the App. 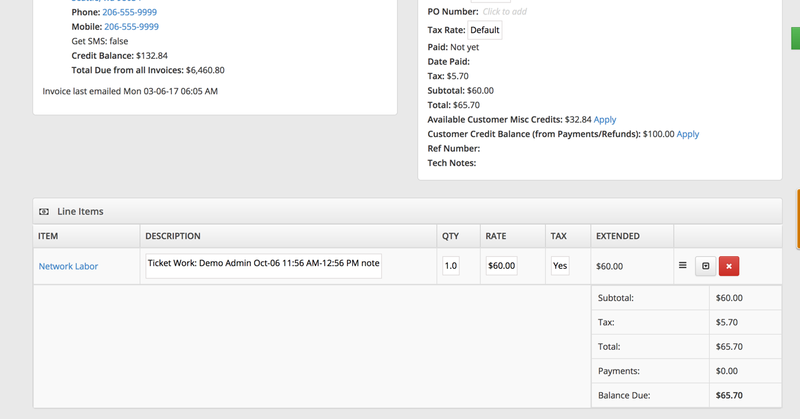 We've implemented the Square app so Techs can take payments when they do a site visit for a client. However, when they add time to the ticket it currently is NOT added to the total cost of the invoice. The tech needs to use the web interface to mark the time as billable, which in essence makes the app pointless. It would be much easier and greatly beneficial for the system to automatically add time recorded on the ticket, in the app, to the invoice. You can add a comment in the app, input the number of minutes spent, and toggle the “Charge Time Now” to bill for time in the app! Add a field so that customers tax ID can be stored along eith exemption status. When a customer is Tax Exempt, we would like to be able to record their ID number for future reference, like when the state tax department comes to call. I would find it very handy to have a reminder or field to accept digital signature when/after taking payment. This is especially true now that we're using the integrated credit card payment system through RS, instead of through a credit card terminal. It is important for potential chargebacks (I've dealt with a couple of these in the past, though not yet with the new processor, authorize.net) to have some sort of signature on file relative to the credit card transaction. This was also suggested in a comment on another thread, but I never saw a new thread started on it. "...and in RS, after processing a payment for a customer as part of the checkout procedure, it would be cool if the signature screen automatically popped up as a reminder (much in the way the notice appears telling you that the ticket is still open)." We have a contact form on our website where customers can submit their name, email address and phone number to automatically get an informational email from us. Right now, this just forwards to a mailbox where we have to manually enter in the customers information into RS. It would be awesome if there were a website integration that could take the submitted form data and add those fields into our customer database. We could obviously have "website form" as a static value for the "referred by" section. Does this sound like something that would be possible? Currently when I send out an invoice it is accompanied by all the tickets that comprised the invoice (and all the data from each ticket). I'd like to send only a one or two page invoice without the backup. If there is a question about an invoice we can THEN send the backup. I think the way to do this is go edit your Invoice Template to not include the ticket, then if they want the detail – you can go to the Ticket manually and send them the PDF of the whole ticket. Quite often we have to attend a customer site multiple times for 1 reason. it would much easier to create multiple appointments on that 1 ticket so that we can track every time we have attended. We use the calendar as a historical resource to look back and see where someone was and for how long so altering an appointment on a ticket really messes this up. I also don't want to have to create a ticket for every visit for 1 issue, because then techs would need to trawl through tickets to get info on diagnosis' and work already completed. This totally works! You can make an appointment from the ticket with “New → Appointment” or from the calendar page. The app adds a comment for each check in and check out - can that be removed? I would like to only add a comment if I do a custom check in. This is there in the app already – go to “Timer Entries” and click start. That will not add a comment to the ticket, it’ll just run the timer like the web app. Would like a way to send notifications to certain users email when something in a category sells. For instance I have a physical store, but I also have a different department that handles only online sales(ebay, etc). When something say in my "Phone Sales" category sells it would be nice for an email to automatically be sent to my employee in charge of my online store so they instantly know to take the item down from all online markets. This can be accomplished with the Zapier integration. You’d need to setup a trigger for invoice or payment – and filter for the category you want. I bet you could find someone online to help with it if you get stuck. Good luck!